Hello Aspirants, Download Free Bank PO English Language Chapterwise Solved Papers Book PDF appearing for the various competitive exams like bank PO, SO, Clerk and you would be looking for the current affairs for the 2017 which is the main hurdle in the exams for General awareness. Don't worry we JobsFundaz team has got a FREE E-Book for you which will help you to prepare for the various exams. You can download the book from the link given below and start preparing for the exams. And keep following us for more study materials for the exams. Feel free to ask questions in below comments. Previous years, solved papers help not only in getting an insight into the recent examination pattern but also help in practicing the questions asked in the previous years, examinations. This book has been designed for the aspirants preparing for various Bank PO Recruitment Examinations conducted by government and private banks across the country. The present book for Bank PO English Language has been divided into nine chapters namely Spotting the Error, Sentence Improvement, Double Fillers, Sentence Rearrangement, Cloze Test, Reading Comprehension, Idioms Phrases, Synonyms Antonyms and Miscellaneous. Each chapter in the book contains ample number of solved previous years, questions asked in the last 17 years, (2000-2016) Bank PO examinations. The questions asked in previous years, Bank PO examinations have been solved in detail with explanation wherever required. The book also contains highly useful study material to help aspirants learn the concepts comprehensively. Also unsolved practice exercises have been provided at the end of each chapter to help aspirants revise the concepts covered in each chapter. The book also contains five practice sets designed according to the current syllabi of the Bank PO recruitment examinations. With over 4500 previous years, solved questions, this book covers questions asked in previous years, examinations like SBI PO, IBPS PO, Nationalised Bank PO, Insurance Sector Exams, etc. 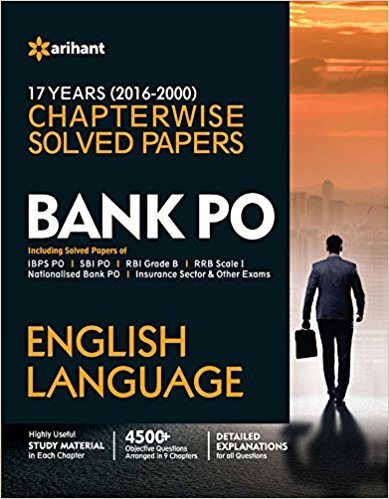 The book also contains 2016 Solved Papers of Bank PO examinations to help aspirants get an insight into the recent examination pattern and the types of questions asked therein. As the book contains ample practice material in the form of previous years, solved papers, it for sure will help aspirants score high in the upcoming Bank PO Examinations.! So this was all about Download Free Bank PO English Language Chapterwise Solved Papers Book PDF. Hope you liked our article and you would have downloaded the books and start preparing for the exams. This Book 2017 would be like a boon for you which covers all the current affairs of the year 2017 so you can easily tackle the General knowledge paper. Keep visiting JobsFundaz for more study materials stuffs. You can follow us on Facebook or Subscribe us through email. For any questions regarding Download Free Bank PO English Language Chapterwise Solved Papers Book PDF comment below.